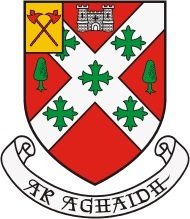 The Castlebar Coat of arms. A reader submitted a query regarding the town Coat of Arms. The responses received on the nostalgia board are reproduced below. You can still contribute to the board on this topic. "Could someone provide me with the meaning and/or history behind the Coat of Arms for Castlebar? I have researched, but am not finding anything online. I'm American, but my family immigrated from Castlebar. I am doing research to share and I want to be thorough. 1 The name of the town is commemorated by the introduction of the Castle of the Barrys. 2 Two Yew Trees are depicted because Castlebar is the Capital of Mayo,which is the Anglicised form of Maigh-Eo i.e. Plain of the Yew Trees. 3 The Parish of Castlebar is officially known as the Parish of Aglish, which means the Parish of the Church and the reproduction of Crosses in the Coat of Arms is an heraldic device to refer to the Church. 4 In the Battle of 1798, the weapon used by the Irish participants was the Pike, and two crossed Pikes are introduced to commemorate this victory over the Red Coats. 5 The motto of the Town is " Ar Aghaidh " - Forward. The first flying of Castlebar's coat of arms took place at a public event on 30 August 1953. The country's Assistant Chief Herald Gerard Slevin informed the Urban District Council earlier that year that despite being the county town and the fourth largest in the province, the Genealogical Office in Dublin had no record of a coat of arms for Castlebar. The UDC agreed that in preparation for the Irish culture festival An Tóstal, the town should design a shield that would be displayed with those of other leading towns during the festival highlight in the capital in 1953. The symbolism is as Brían Hoban explained. The town motto is a gaelicisation of the French motto of the Barry family, Boutez-en-Avant. Castlebar Town Council. His daughter Eayna Egan carries on the practise. She may be able to help you. I don't think he did. He designed the Mayo County Coat of Arms but I'm not sure about Castlebar. Well done Brian, nice one. How many Castlebar folks would have got all the elements to the town crest. In 1953, the formal ratification of the Arms by the Chief Herald cost thirteen pounds which was paid by the UDC with help from Castlebar Community Development Association. Also, a town with a Coat of Arms is entitled to a Town Flag which is a retangular version of the design on the shield which bears the arms. A cara, moons ago 'joxer' explained the shield to me .But my memory tells me he used the word 'Barony' might that word be an older version of the word 'Parish'?? Thanks to everyone for posting. I am the person who originally submitted the question. If there are any more details about the colors used that would be great. Also, are there any photos of this as a flag (someone mentioned flag use)?